Chase Waller, a 2007 member of the Seattle Cascades, submitted this photo and caption. 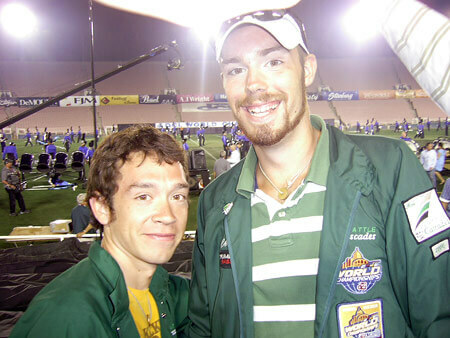 This is a picture of my friend Ricky and me at the 2007 World Championship Finals in Pasadena this last year. He "aged out" of the Cascades in 2006, my rookie year. We were able to check out the action from the 40-yard line for a portion of the event. Being in the front row is definitely an amazing feeling and the only way to watch a drum corps performance!